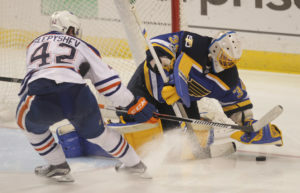 Cam Talbot stopped 25 shots from St. Louis, and Milan Lucic and Mark Letestu scored to lead the Edmonton Oilers to a 2-1 victory over the Blues on Tuesday night at Scottrade Center. Talbot made his league-best 57th start of the season, and snapped a two-game losing streak. Meanwhile, the Blues playing their first game after trading fan favorite Kevin Shattenkirk, dropped their fourth straight after a six-game win streak under Mike Yeo. The Blues trail Nashville for third in the Central Division by seven points and have just a one point lead over the L.A. Kings for the 8th playoff spot in the Western Conference with a game in hand.